We hoped Dean would produce some pretty light phase lambs for us, and he did not disappoint. First up, his twins out of Buttermere. You may be asking yourself, “wait a minute, Dean is light phase. Where did that dark charcoal son come from?” Well, remember his grandsire, Mustard, carries the gene for self-coloration, and we know that whatever form of “self” came over with Mustard, it expressed itself in Buckley in 2009 and then Barwick in 2010. 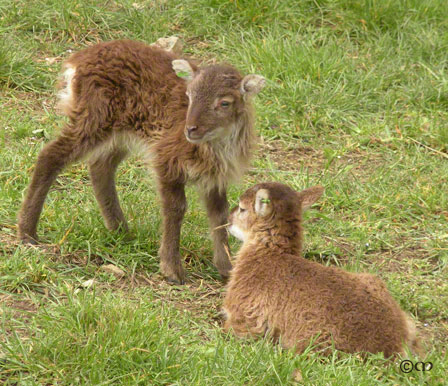 Are these four lambs the sweetest-looking Soay you’ve ever seen? Wow. 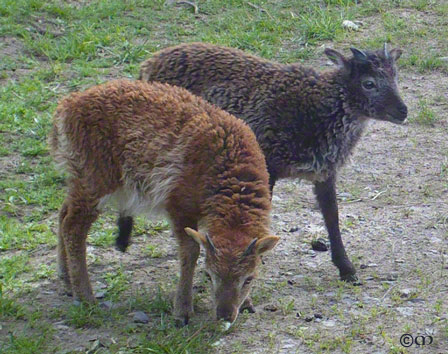 Since I have focused so far on the contributions made by the sires, it is only fair to point out that the mother of tan Hepworth and Fouldon is a plain brown ewe with extensive white spotting — Buttermere — but she is a carrier for light phase. And so is the mother of tan Blakeney and charcoal Barwick, a plain brown ewe (Ellerbeck) with white spotting, carrier for light phase. Isn’t color genetics fun? 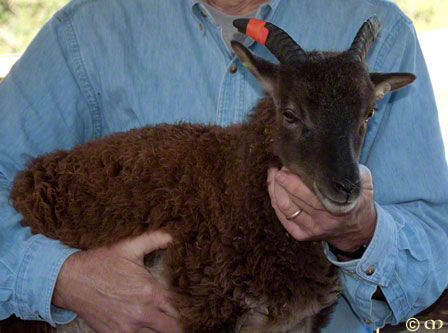 Dean kept producing interesting colors for us right through the end of lambing last year. Remember our pretty black ewe Heywood from the 2009 lamb crop, daughter of Xanthoria, a plain brown ewe, and Curtis,the dark charcoal son of Norris? 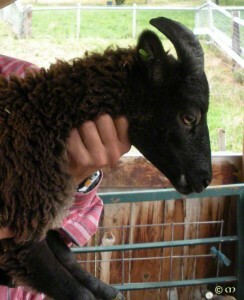 Last year we bred Xanthoria to Dean and what should appear but another black lamb. 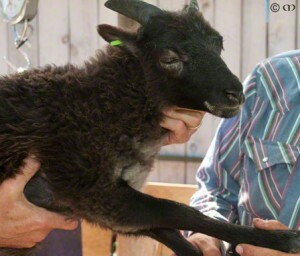 There’s a video of Cley the day she was born if you’re interested in seeing how totally black she was when she came out. She has the same unusual eye “ring” we saw in Cantrall and Buckley the year before, and the same white “dot” on her lip (but this time on her right lip) that we saw in Heywood. But Heywood is out of Norris, and Cley is out of Mustard. What’s going on here? Genetic diversity at work! Too bad you can’t see Xanthoria’s white belly and dark legs in this picture – typical British pattern and markings. 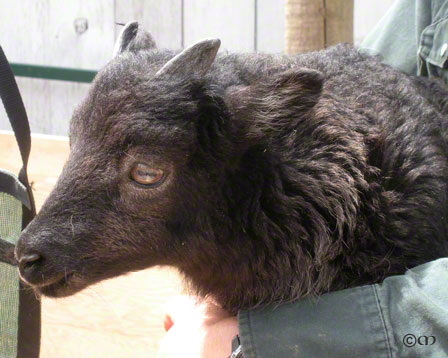 She was described as “very dark brown with black legs” as a lamb, so she must contribute color genetics to her black lambs. But look back at the picture of her with Heywood. Who knew she would throw black lambs? Westerfield never was as “chocolatey” as Cantrall, and Westerfield’s eye rings faded as he matured, leaving him looking much more like a conventional light phase British Soay sheep. 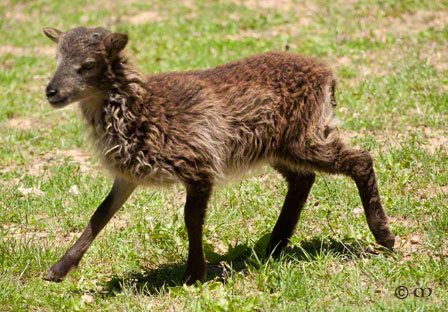 Hmm, Yarmouth’s legs look pretty dark in this picture, don’t they? 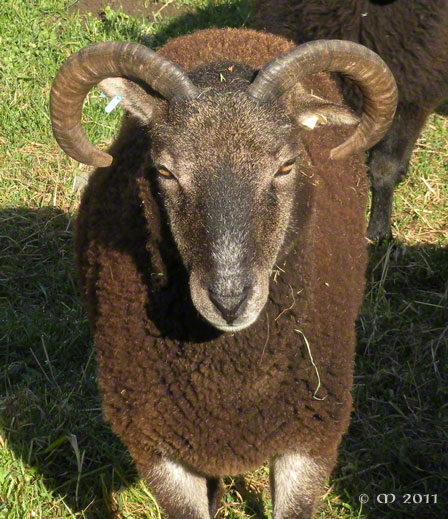 I need to get back out into the gimmers’ pasture and see how her legs and face look by now. Maybe she has some of the darker coloring from her grandsire after all. 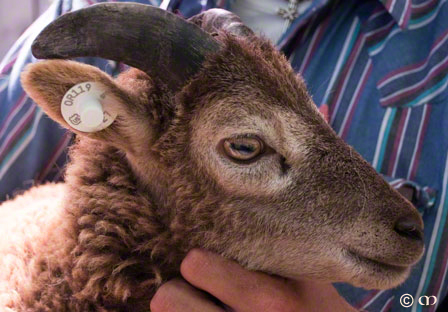 It’s no secret that a lot of the lambs from the AI project, both generations, remain on our farm. What else would you expect from a geneticist? 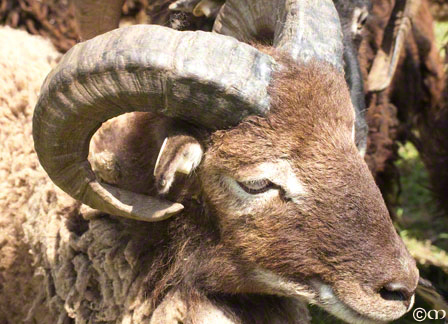 But we have sent AI grandlambs to new homes in seven states and British Columbia (so far) and we expect these ambassadors of diversity to contribute to the important work of genetic conservation and preservation in the flock throughout North America. With 2011 lambing set to begin this week, who knows what new color adventures await us and where they will end up? Stay tuned. I keep wanting to make up a visual genealogy chart: like a family tree, with photos. Really complicated, and it would probably take up a wall, but fun! Thanks for all the details.